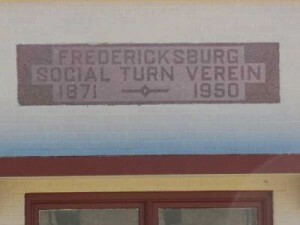 Join the Fredericksburg Dance Club at the Turner Hall (Fredericksburg Social Turn Verein), at 103 E. Travis Street, Saturday from 8 pm to Midnight. $10 at the door. Beer & Set-Ups available. Great dance floor and great music! A Turn Verein (that’s the Texas spelling of Turnverein) was orginally a gymnastic and social club begun in 1811 in Germany by Friedrich Ludwig Jahn. Turn Veriens were established all over the country promoting gymnastics and calisthenics, and Turners contributed to the standardization and popularization of bowling nationwide. Mary Lou LeCompte, “TURNVEREIN MOVEMENT,” Handbook of Texas Online(http://www.tshaonline.org/handbook/online/articles/vnt02), accessed February 15, 2011.